Blue-green algae are microscopic, plant-like organisms that occur naturally in ponds, rivers, lakes and streams. Although often blue-green, they can also be olive-green or red. Blue-green algae are not normally visible in the water, but populations can rapidly increase to form a large mass or scum called a bloom when conditions are favourable. Blooms most commonly occur in late summer and early fall. They thrive in areas where the water is shallow, slow moving and warm, but they may be present in deeper, cooler water. 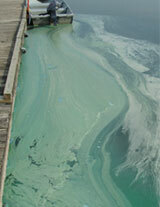 Dense blue-green algae blooms may make the water look bluish-green, or like green pea soup or turquoise paint. Very dense blooms may form solid-looking clumps. Fresh blooms often smell like newly mown grass, while older blooms may smell like rotting garbage. One key factor contributing to the growth of blue-green algae is the amount of available nutrients such as phosphorus and nitrogen. Agricultural, urban and storm water runoff, effluent from sewage treatment plants and industry, and leaching from septic systems can increase the levels of nutrients in water bodies that can promote algae growth. In Ontario, phosphorus tends to be the nutrient that influences the growth of algae. Take a cautious approach, as some varieties of this algae can produce toxins that are harmful to both humans and animals. Home treatment systems may not remove toxins and can get easily overwhelmed or clogged, so they should not be relied on. Do not boil the water, or manually treat the water with chlorine or other disinfectants, as this could increase the toxin levels. Contact the Windsor-Essex County Health Unit for more information. Ontario is concerned about the effects of blue green algal blooms in our water. We know there is more to do, and we look forward to working with our many partners. Ontario has a 12-point plan outlining how we are working with our many partners, to fight algal blooms in the Great Lakes and other lakes and rivers. We will continue to collaborate with other provinces, the federal government, U.S. partners, First Nations and Métis communities, conservation authorities, municipalities and other stakeholders on actions to reduce and address algal blooms. Ontario responds to public questions and reported sightings of algal blooms. Fact sheets and the Guide to Eating Ontario Fish 2017-18 are regularly updated. Provincial stewardship funding has supported thousands of voluntary actions such as septic system repairs and upgrades across the province. Ontario’s Showcasing Water Innovation Fund has contributed $1 million to improve water quality and protect the ecological health of both land and water in the Grand River Watershed. In 2013-14 Ontario’s Great Lakes Strategy contributed more than $2.6 million to address nutrients and harmful algal blooms in the Great Lakes. The Great Lakes Guardian Community Fund has awarded grants to communities and organizations. These grants are for projects that help protect water quality and ecological health by naturalizing shorelines, protecting wetlands, clearing beaches and removing invasive species. Grants of $880,701 have supported 42 local projects along Lake Erie alone. Legislation and programs are founded on science and are often ecosystem or watershed based. The Ontario Drinking Water Quality Standard for microcystin-LR (a common algal toxin) is a maximum acceptable concentration of 1.5 parts per billion or 1.5 micrograms per litre. Ontario has worked with all municipal drinking water systems that take water from the Great Lakes to ensure testing both the intake and treated water for blue-green algae weekly during peak algae season. Working closely with public health units, municipalities and other partners, we provide data to help inform decisions about taking action to protect public health. Ontario has a comprehensive protocol in place for responding to harmful algal blooms. This protocol ensures collaboration with local health units and local Medical Officers of Health to effectively manage algal incidents, including quick screening of bloom samples to identify potential toxins. Contingency plans are developed by municipal drinking water systems to keep drinking water safe from the potential impacts of blue-green algal blooms. If a harmful algal bloom is suspected, samples are submitted to laboratories licensed for analytical testing of total microcystin and microcystin-LR. The Walkerton Clean Water Centre delivers required refresher courses for drinking water system operators that include responding to and addressing potential algal concerns at drinking water plants. There is more work to do. We look forward to continue to work with all partners to reduce nutrients and keep drinking water safe.